The International experimental film festival THE UNFORESEEN is conceptualized as a support for reflection, development and production of experimental film. This festival is envisioned as opening of a space for articulating new politics of public support and of providing infrastructure, educational and production models in the development of experimental film. It is going to be achieved through discussing the meaning of the experimental film today as well as its possible practices. The format will be the one of educational, special and competition film program as well as of audio-visual and live soundtrack programs, discussions and lectures. This curated program is brought to you in collaboration between Center for Cultural Decontamination / Medijska arheologija and the analog film lab and audio-visual initiative from Belgrade, Kino Pleme. The aim of this selection is to showcase the most fresh and exciting works of analog and digital cinema today, in super 8/16/35 mm and in digital formats. This program is a continuation of previous festival editions, drawing its attention to contemporary international experimental film production, which incorporates the achievements of modern technologies in the development of the film language and its forms. 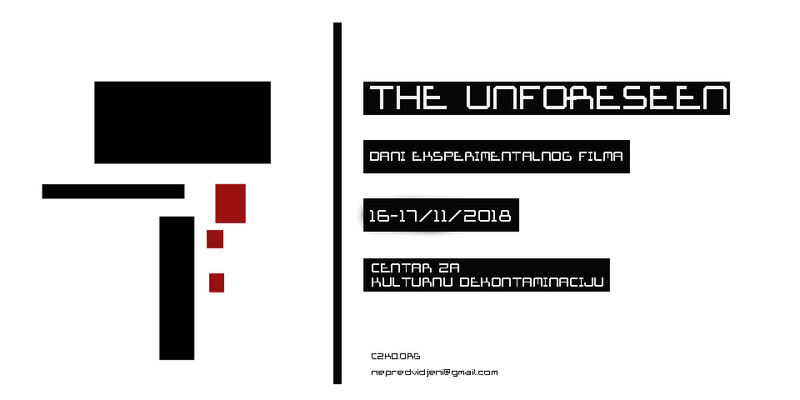 Films in three genres (experimental film, experimental animation and experimental documentary) can be submitted to The Unforeseen Festival by November 11th, 2018. Films have to be produced in 8/16/35/ or digital since 2016 and should be no longer than 20 mins in length. We're not accepting landscape art, glitch and video art works. Please include the following data in your mail: author’s name, the year of production, short synopsis, the format, the running time and optionally a poster or a screenshot. The results, the jury as well as the complete festival program will be announced timely on our website, FB page and the CZKD website (www.czkd.org).